Discussion in 'General Discussion' started by ( . )( . ), Feb 8, 2019. I own 4 prs core guitars.. a 91 CU24 with birds, a 2011 CU22 with outline birds, an 01 McCarty Standard with moons, and a 97 CE24 with dots. Aesthetically, I like the 91 birds the least - in fact, I wish PRS would make more guitars with dots or moons, because some of us just don’t dig the birds that much. That said, the 2011 CU22 is by far the best of the bunch playability wise so I think PRS is improving with age. The all hog McCarty is pretty special also though. I just wish I could get a new core model besides a DGT without birds. I understand that it really doesn’t cost PRS more to do birds nowadays, and that’s their signature thing, but I still would like the option. Side note - I’m not a fan of most of the S2’s (I know I can get a dot satin) I’ve played - maybe I’m just spoiled, but they don’t feel anything like what I’m used to. In all honestly, I generally prefer SE’s. 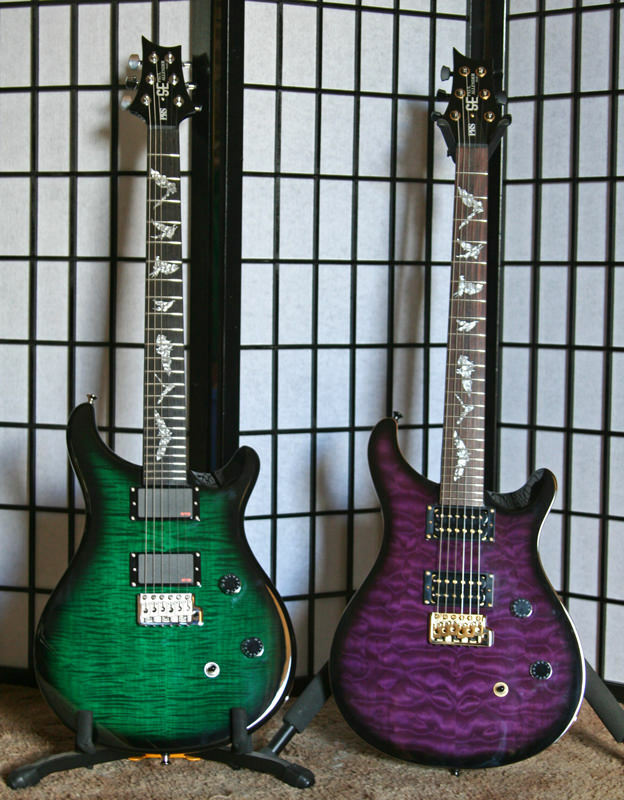 Speak to your choice of PRS sales rep. They can special-order one for yourself with moons or dots that would reduce the cost a little from a core model. They're kind of like "moon birds"
Eddie kim, Rusty Chos, Boogie and 2 others like this. bodia, Eddie kim, Mozzi and 2 others like this. I have a couple with moondots. They’re cool. But I dig the birds too. The whole story of Paul’s mother being a birdwatcher, and getting artists to render versions from a bird field guide is interesting to me. Putting your name on a headstock is one thing, putting a tribute to your mom on buzzions of guitars is bueno! Mozzi, LSchefman and Glide-bpm like this. Both of mine have moons. Wish I had birds on one, but it's a minor detail. I don't pay for 10 or artist upcharges either anymore. Been there, done that, just want to enjoy them. The purple one was my first PRS... still have it! Was very impressed with the bat inlays... so nicely done. I've had few with moons also, they are very classy. Since I don't have one with Birds, I will love the moons forever. I've seen one listed for nearly two years around Detroit CL at a low price and it just hangs on. Bumped weekly then off for a while then back on. I haven't seen it since the holidays so either they just pulled it or maybe it sold. But haven't seen any NGD posts with a super deal either. So it will be back I expect. That's no moon, that's space station.